Few brands in the world are more synonymous with their industry than Ladbrokes are with sports betting. They are widely regarded as one of the Grandfathers of the industry and their decades of knowledge and experience has enabled them to maintain as they develop from the high street to that of online. The sports betting side of the company has always been the heartbeat. Where others have shifted into fancy promotions, social media and gimmicks, for the most Ladbrokes have done what they’ve always done and maintained as a strong, enticing bookmaker. As one of the biggest in the industry, it’s clear to see that whatever they have been doing, is working! As with all our reviews, we will like to test each bookmaker against the opposition. The idea is to find out who is doing the most to be the best. With Ladbrokes it means that we need to compare them with the best and one the aspects that we will be doing this with is that of their pricing structure. Ladbrokes have got a bit of a reputation in the industry for being more consistent than that of their some of the closest rivals when it comes to pricing. We tested their odds to that of a host of upcoming Premier League matches and also lower league matches to find out exactly where they sat. From our tests we would have to say that Ladbrokes are fairly strong in all aspects of Premier League betting, without ever being amazing. In fact, from the 10 games we looked at (small sample, but as many as we could get our hands on at the time of testing) they were actually never best priced on any market. You may think that’s pretty disappointing from “one of the best” and to be honest it is. But, it’s not all doom and gloom. For what they lack in terms of being the best price, they are never far behind. We looked at a series of Match result markets for our comparison and whilst yes, they weren’t best price on any result, they were never far off, with a home win, away win or the draw. What you often find is that a bookmaker is best priced for say a home win, with the draw and away win almost falling off a cliff to compensate. From the outside it looks pretty poor from Ladbrokes, but to be honest, it’s actually pretty shrewd we think. They are saying to punters that they can back all results on their site with relative confidence that the price you’re getting isn’t going to be far away. We’ve actually seen this trend increase in recent months, with Coral being a prime example of that. Bookies are starting to offer a more level playing field for their punters, which allows them choice and value at the same time. We’d also recommend that accumulator bettors give Ladbrokes some serious consideration. The consistent pricing structure often returns much larger odds than that of erratic pricing where you get 1 best price and 2 poor prices. To back this up, as we worked down the leagues to that of the Championship and the lower leagues, we found an almost identical trend. Very few best prices, but right up there with pretty much all tehri odds for each market. This isn’t going to be to everyone’s cup of tea though and if you are someone that bets on large singles, be it in the Premier League or League 2, Ladbrokes might not be the best choice. For most of us, this “Steady Eddie” approach actually works out to be better value than most boasting about being best priced for a certain bet. There’s very little to complain about when it comes to market coverage as well, with around 180 bets to choose from with most of the top-flight action. Markets drop off ever so slightly as you move down the leagues, but it wasn’t really noticeable and if they didn’t produce the actual numbers for that market, we likely wouldn’t have even noticed. The international coverage is really second to none to be honest. You get the majority of games that most offer, such as the Spanish, Italian, German and French, with each of these you see a huge range of leagues covered as well. In fact, we will go as far as saying that there aren’t many, if any that beat Ladbrokes when it comes to these lower league foreign games. They also cover a massive range of what we like to call ‘niche’ leagues, such as Guatemala, Israel and Paraguay, to name just a couple. These aren’t leagues that most of you will be looking to bet on I wouldn’t have thought, but if you ever fancy cracking the Guatemalan Liga Nacional, then Ladbrokes is probably as good a place as any to get stuck in. Get A Price is Ladbrokes version of tehri social media interaction bet. It’s linked up to their Twitter account and all you need to do to place the bet is tweet the Ladbrokes page using the hashtag #GetAPrice and the bet you want to place. We’ve found that they entertain so highly obscure bets as well, which is pretty entertaining actually. These include shots on target, tackles, cards, hit the post and loads more. You can really get creative with them and whilst it’s virtually impossible to track the value compared to the industry, they look to have some enticing odds from the ones we saw. It’s also worth noting that you are able to back other peoples selections, as well. This market is one that we haven’t seen all that often and it’s where you simply back the result of the match after a certain period of time. This could work great with teams who are either synonymously fast or slow at either starting or finishing a game. The prices in some of the bets that we saw looked really good value as well and whilst again, little to compare it to, it does look like Ladbrokes have taken a positive step with these types of markets. 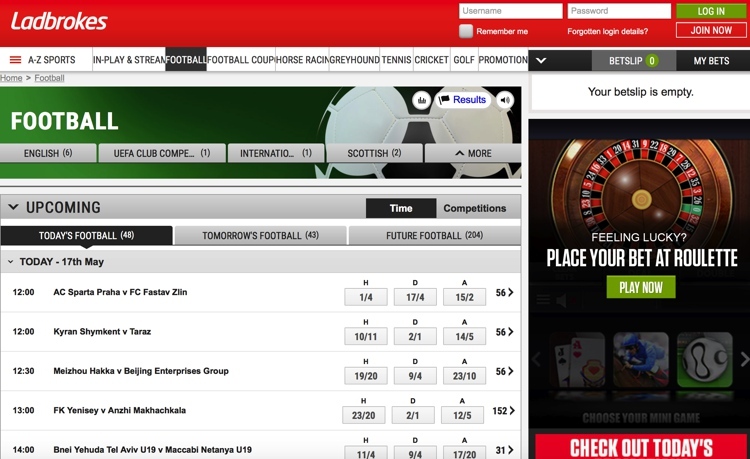 The Grid is one of the latest features to integrate the Ladbrokes system in recent years. The concept is to tie together your online account with the bets you place in tehri high street stores. It allows you to check bets that are placed both in store and online, get exclusive bonuses that are only available to Grid members and also be able to transfer or withdraw winnings from your online account direct in store. There are actually a number of bookies that offer this feature now, but we think that Ladbrokes’ works about as well as any of them. We like the fob that you can get for your mobile phone to simply scan in shop and away you go. Betting exchanges aren’t something that is new to the industry, but the fact that Ladbrokes shave ben able to integrate is very impressive. In fact, we can’t think of any other bookie that has successfully integrated a betting exchange to an already established traditional bookmaker like Ladbrokes. The inclusion means that the functionality of the site goes through the roof. What you’ll find is that the coverage for lower profile games does mean bets sometimes struggle to be matched, but for things like the Premier League and other to flight European games, it works well. Cash out is a feature that has worked wonders with a bookmaker like Ladbrokes. The ability to cash your bets in early to lock in a profit or limit your losses is great in our opinion. Ladbrokes also make it clear which markets they offer cash out betting on prior to placing. Our favourite feature with it all is that it’s linked up to your Grid card. So, if you placed a bet in your high street betting shop and then scan the barcode for the bet when logged into the app, it will apply that bet to your account and then allow you to cash out where eligible. The cash out funds will hit your grid card then you simply take it to the Ladbrokes shop and claim your winnings. The in-play betting section on site is an area that has seen much needed improvement over the last couple of years or so. The design is still pretty iffy for us and we think it looks a little dated and basic. But, this is something that is very much objective and we’ve actually a few people in the office that think it’s a nice design…. weird! Whilst the design is very much out for tender, we thought the functionality of it all was great. You were easily able to jump between sports, with the majority of games being football and then easily navigate to the game you want to bet on. 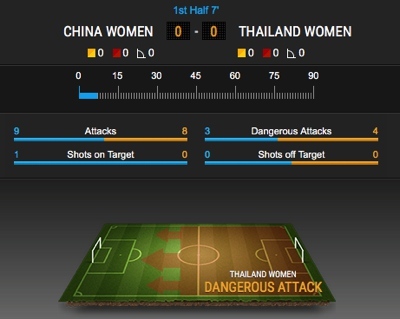 The page includes a good overview of what’s going on and you’re also able to adjust the market that is on offer from the match betting to that next team to score. Whilst the overview of the in-play section isn’t to our taste, once you are in on the game section, it really steps up. The match centre at the top if one of the best we have seen. The graphics look great and it’s super-fast to update and imperative yet underrated feature when betting on live sports. The section also shows a decent number of stats as well, which are great for forming much more improved judgements on your bet. This may sound like an odd comment to make, but the in-play section just seems to work. It’s tough to really say why, which makes it strange. It just does everything you ask and it’s one of the sharpest for accepting bets as well, which is another huge tick. The design when into the game is lightyears ahead of the rest of the site in our opinion and we think there are few better choices in the industry at the minute than this of the Ladbrokes in-play section. As with the majority of bookies, the maximum amount that you can win in a single 24 hours at Ladbrokes on the football is limited. Luckily for most, that limit is set to £1million, which means that the majorty of bettors will ikely enver get near it. It is worth noting that these limits are about as high as you will find, especially as you work down the leagues. If you think that high limits will benefit you, then Ladbrokes could be a great shout. The Ladbrokes website is about as comprehensive as you are going to find. It’s one of the oldest and one of the biggest, with decades of experience. It’s not without its flaws though and the design for one is going to be something that many either love or hate. For some, this could even be a deal breaker. The meat of the site, in terms of odds, pricing and features is just as you would expect. If you are a punter that likes the reassurance of using a bookie with decades of heritage and expertise, Ladbrokes will be for you. If you are someone looking for that little more quality from your bookie, then there could be alternatives.